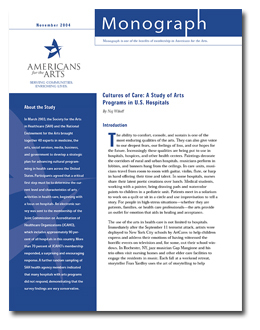 In March 2003, the Society for the Arts in Healthcare (SAH) and the National Endowment for the Arts brought together 40 experts in medicine, the arts, social services, media, business, and government to develop a strategic plan for advancing cultural programming in health care across the United States. Participants agreed that a critical first step must be to determine the cur-rent level and characteristics of arts activities in health care, beginning with a focus on hospitals. An electronic survey was sent to the membership of the Joint Commission on Accreditation of Healthcare Organizations (JCAHO), which includes approximately 90 per-cent of all hospitals in this country. More than 70 percent of JCAHO’s membership responded, a surprising and encouraging response. A further random sampling of SAH health agency members indicated that many hospitals with arts programs did not respond, demonstrating that the survey findings are very conservative.